The USS Princeton (CVL-23) was lost on October 24th, 1944 at the battle of Leyte Gulf, after a single bomb hit the aft elevator and several ‘locked and loaded’ Avengers. Eight F6F’s from Fighting 27 were on patrol and engaged around 80 Japanese aircraft in an attempt to protect their ship. Despite their heroics the carrier was lost, leaving the squadron homeless and they were dispersed amongst other carriers. My plan is to build a diorama with two cats on the USS Essex, where several of VF 27 landed shortly after the sinking of Princetown; one each from Fighting 27 and Essex’s own famous Carrier Air Group 15. After landing on the Essex, Admiral Sherman was so incensed by the non-regulation nose art that he ordered the cats repainted that very night. So this build will showcase the last ever seen of those infamous cat mouth Hellcats of the Fighting 27. I’ve never built two of the same kits simultaneously before and it gives a much greater appreciation of their relative merits. 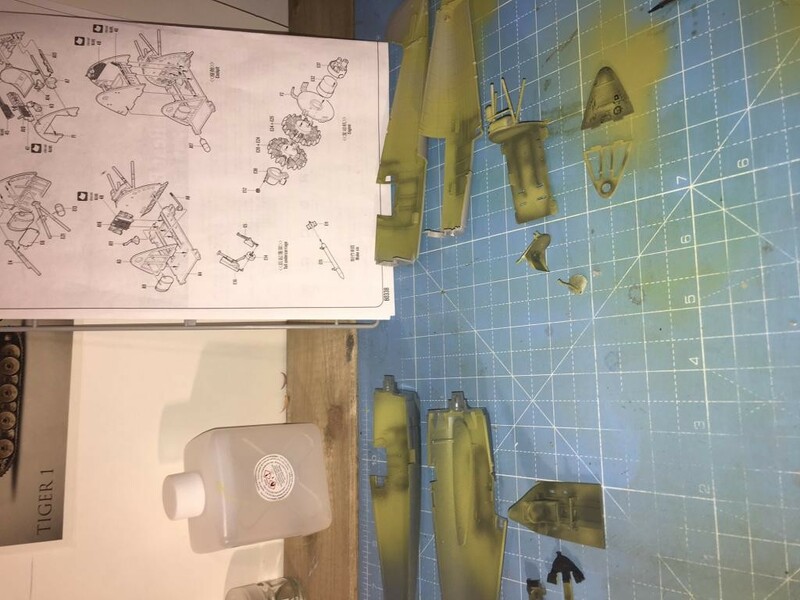 After my struggles with the last build (Revel 1/32 Lightning) I went for something quick and easy, namely the 1/48 kits from Eduard (weekend edition) and the somewhat infamous HobbyBoss F6F5. After just a weekend (I found five Hellcats in the stash, so no waiting!) I’m almost ready to join the fuselages. 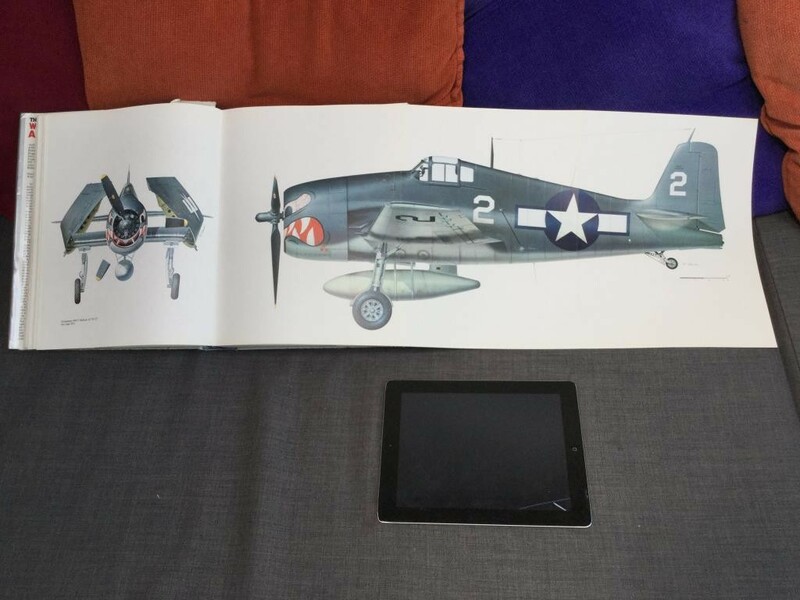 The photo of the Hellcat above comes from the incredible book, ‘The great book of World War II Airplanes’ illustrated by Rikyu Watanabe. 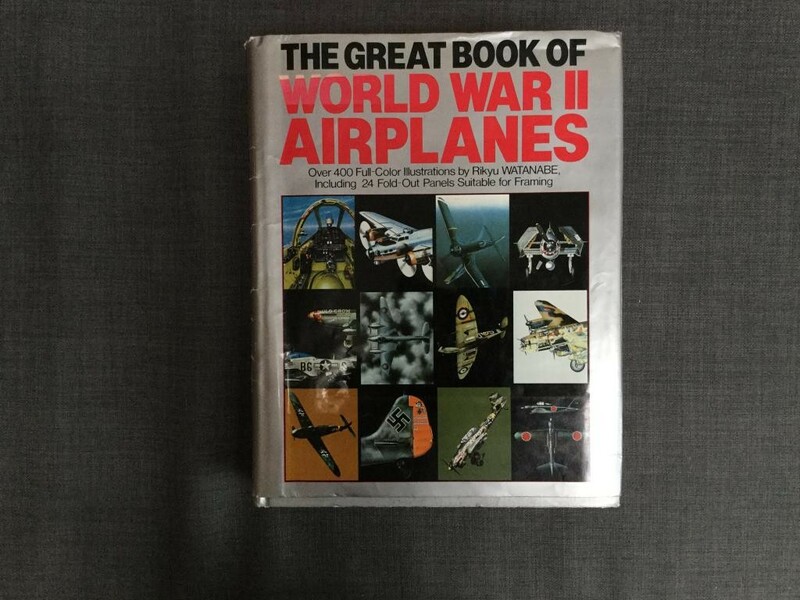 If you only have one reference book for modeling this should perhaps be it (although it has only 12 aircraft they are planes that you could just build forever). Amazing technical drawings, beautifully artistic colour scheme details, and some great history. 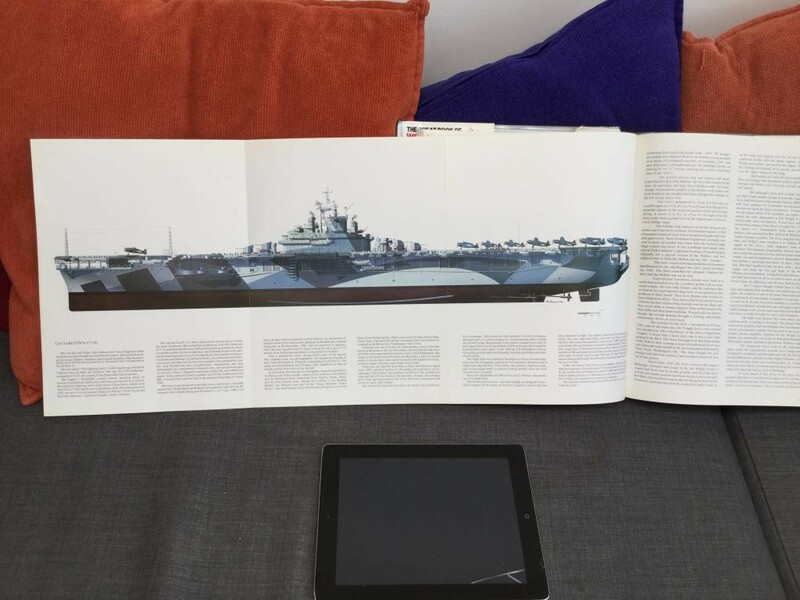 Several of the drawings are in gatefold format and are huge and more than suitable for framing. That sounds like a great plan David. I also have that book, and yes, it is incredible isn’t it? The technical drawings are just fantastic. It was my main source when I scratch-built a cockpit for my Monogram A6-M and Spitfire. Yes, the book is amazing and I often find myself just looking through it. The illustrations are breathtaking and the writers are knowledgeable and passionate about their subjects. The only problem I have is with the sheer size of it as it’s difficult to get in a comfortable position with other for any length of time! Lookin’ good, David…quite the assembly line ya got goin’ on. It’s an idea I brazenly ripped off from our fellow iModeler, Louis! It’s OK……………. You’re forgiven 🙂 🙂 😉 I really think it’s the best way to build similar (or the same) kits when you have a few in the stash pile. I got the idea from Henry Ford………………. Ha! Henry Ford. Brilliant – any colour so long as it’s navy blue, light blue, and white! Or you could get it in any color you wanted………… as long as it’s overall Glossy Sea Blue……………. You’re welcome my friend. I just noticed your build thread was started. David, I always wondered what happened to the sharkmouths on their F6Fs. I’m surprised they lasted as long as they did, in the fleet. Maybe ashore, but not floating on the boat. Good start on the duo! I don’t think the carrrier brass at that time were renowned for a sense of humour – even if it was a splash of paint for guys putting their lives on the line every day. Discipline on board was everything, I suppose. Great job, and I have that book as well, it IS wonderful! I have to tell you, Rob – I love that book. Nice work an back round info. Hi Robert. Thanks for that – I’ve started a work in progress if you feel like having a look. Hope you are well! It looks like you have a good start on the project. Great story line too. I really enjoy history, especially WW2 era stuff. I don’t have that book, but it looks like a good one to watch out for. Two thumbs up David !!!!! I have a ‘build in progress in the ‘groups’ section now, so will get regular updates on there. When do you think your ‘Cat’ groupbuild will get grennlighted? I’ll now need to get the Hasegawa kit. Damn you. The “Cat” build will start soon after the Midway Group build has concluded. It will probably be right after June 7th………….. about 3 weeks away. I’ll keep you posted. You will really like the Hasegawa kit, should you decide to get one…………….. I know that I have. Louis, it’s eBay for me tonight! Looking good David, I’ve build and posted the Hasegawa Hellcat on this site not long ago. It went together very well only needed a seat to really set her off. Would recommend after market decals because Hasegawa seems to have trouble producing the color white. I received the book you posted several years ago as a Christmas present, it’s a really great reference tool. Thanks, Tom. I really liked your Hornet TBD, a lovely build that really looked as though it was ready for battle. I’ll probably have have to make my own masks as the markings I want for one of the cats don’t exist. The other I’ll probably do David McCampbell’s Minsi III. There’s a very famous picture of Carl Brown landing his F6F-5 “Paper Doll” aboard Essex, with Princeton burning on the horizon directly behind him. Tom, that really is one of my favourite photos. The photo is dramatic enough, but when you know what the smoke in the background is it really showcases the intensity and losses of that massive battle. 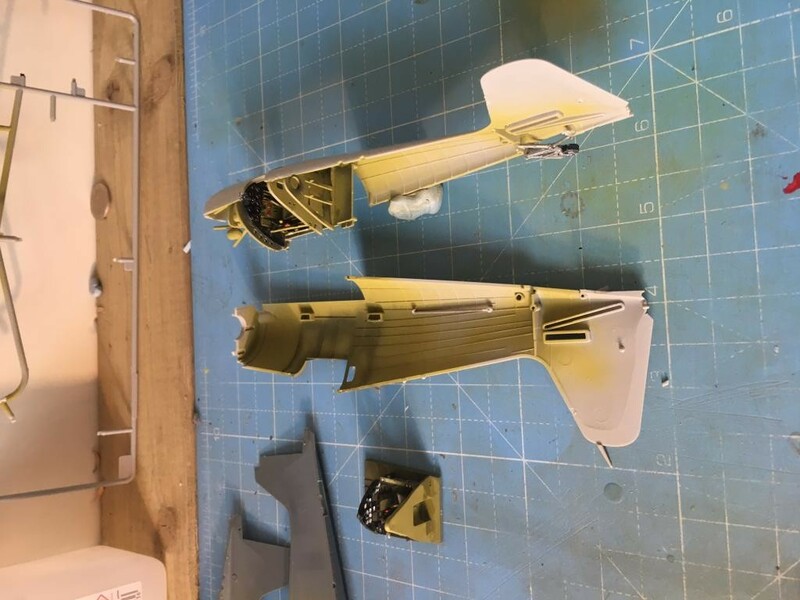 You can mate the HB folding wings to the Eduard fuselage and get a nice model with the wings folded, otherwise the HB kit is a waste of time and money. Check my article over at Modeling Madness on how to do the kitbash. Hi Tom – thanks for that. 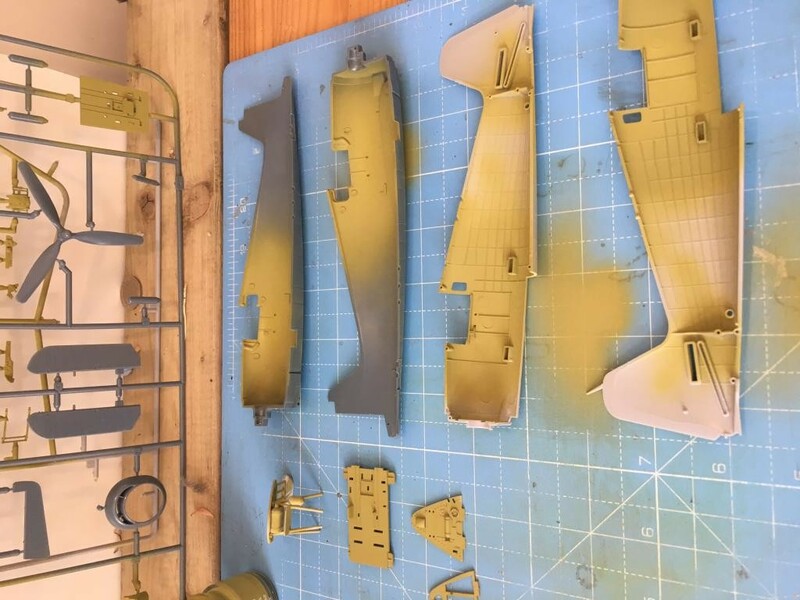 I don’t know if you have checked in on my post of this in the ‘build in progress’ section, but I’ve given ‘Fabled 15’ a shameless plug – hope you don’t mind! The cockpit of that HobbyBoss model is just massive. I’ll check out your build and thanks for the heads up.